The people here are not trained to work at Global. They have taken our tax paid dollars,and ruin our air, water, and there is still a high pitched noise bothering the formerly quiet neighborhoods! When another country, or state makes them a better offer they will leave NY state just like they did Texas! While this is an excellent development for the region, I still can't help but lament that it was poor long term planning to position this in rural Saratoga County and away from the density of the region's cities. Many of my friends from Saratoga are already beginning to shake heads over how out-of-scale this development is to the rural nature of their community and have begun to see the effects of sprawl rear its ugly head. There was plenty of space in our cities to encourage smart, dense growth, which is a real lost opportunity for the region. This article also highlights what I thought was a illogical move to separate the semi-conductor cluster from the nano-cluster in Albany, due to the symbiotic relationship between the two. Granted, they are only 30-40 minutes apart, but due to the scale of technology being used, the sensitivity over its development in tightly collaborated labs, and the benefit that result by having diverse scientific communities rub shoulders with each other to stumble upon new scientific insights, I think it was a poor idea to keep them so far removed. An international chip fab makes multi billion dollar investments in our little area and people find negatives in it. Do you have any idea how badly others would kill for this? Typical Albany mentality. "Maybe that's starting to happen now." If it is true that this is an additional 2 billion investment that will bring another 1000 high paying jobs to the region and NY didn't chip in anything to make this happen, I think we can safely say it is starting to happen now. If you read the Oregon papers, they don't seem too optimistic about their ability to compete with NY for Azalea. I, too, have concerns about the long-term viability of these projects and dread the day when another city or region offers better incentives and the whole show leaves the area. However, the more I think about, the more I realize that it is our expectations that are faulty. Do we really expect any industry to setup in a particular area and then stay there forever? There's going to be fluctuation and movement, as seen in other industries. The important thing for us is to remember this is a temporary boon for our local economy. We need to take advandage of it now, recognizing it will not last forever. The danger lies in the liklihood that we'll put all our eggs in this one basket, and be unprepared for inevitable change. In reality, now that we've set this up and it's starting to take off, the region and state should be exploring the next big thing. Well... 'foundries are quite poorly rated by employees at Glassdoor but Samsung is even worse. Besides, half of Malta site workers are on temporary visas which are not transferable between companies. I hope the next big thing for Capital Region economic development doesn't cost us $2 billion. 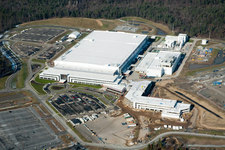 This is rumored to be apple's new site for wafer manufacturing.